Learning moment: artistic imagination of “teaching moment” in a marine biology lab. Photoillustration: Nematosynthesis/Adaptation of David Stuart Image/Shutterstock. Probably all large sea anemones have a potential to cause severe damage to human skin. Surprisingly, the sea anemones found in the temperate areas of the Northern Pacific Ocean—anecdotally, at least—seem to be significantly more dangerous than most Indo-Pacific Anemonefish Host Anemones, and as I was thinking about the cures for jellyfish stings in a companion post I am writing, I realized that perhaps a look at the potency of anemone stinging cells would be a good starting place. The worst example I personally know of shows how dangerous the sting of a Fish-Eating Sea Anemone, Urticina piscivora, could be. Early one year in the 1980s, I arrived a couple of days in advance of a summer course on mollusks I was to lead at a university teaching and research marine laboratory on Vancouver Island. Fish Eating Sea Anemones apparently don’t make for good sashimi. Image: Ronald L. Shimek. Ph.D.
At the particular date and time of the incident I relate, I was, temporarily, the only person on campus remotely resembling either a marine ecologist or an invertebrate zoologist. As such, I was the “go-to” resource person for questions related to those disciplines. Generally, this meant that after students noticed that something was going awry in one of their aquaria or experiments, they would come and ask my advice. Of course, being after the fact, and generally WELL after the fact, like days or weeks, this guaranteed my advice would be too late. But that was all right, as it was likely to be ignored in any case. The standard “working” aquarium for researchers at that time was called a “sea table.” Made of acrylic, these were tanks 1m long x 0.5m wide x 0.25m deep, resting on a laboratory table or on a piece of plywood resting on a tubular metal frame somewhat larger in length and width than the tank. Water flowed continuously into the sea table from a pipe connecting it to the building’s continuous flow sea water system. The sea table drained through a stand pipe fitted into a hole drilled through the sea table’s bottom at one corner, where it connected to a ball valve attached under the tank, which controlled the water flow out of the tank. In turn, this valve typically connected to a long rubber hose, which was the incurrent flow into another, typically identical aquarium situated on a small platform beneath the first one. All researchers, including students, were assigned one or more sea tables, depending upon their needs and table availability. This particular summer session, there were two ostensibly bright young male graduate students competing for research support from one professor for a program leading to an advanced degree. Their potential advisor was a world-renowned investigator of sea anemone biology, and it would be a profound honor for a student to work with him. He was, however, quite ill. In fact, he was dying, although we didn’t know that at the time, and for the first summer in many years remained at his home institution, which meant the students were on their own. Both students opted to work with Urticina piscivora, the fish-eating anemone. 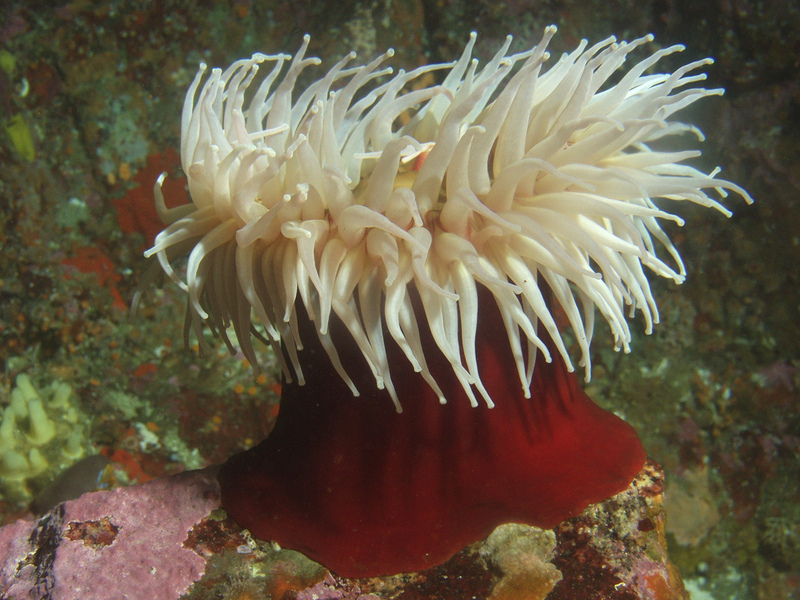 Adults of these particular anemones are large critters; commonly, the deep-red column is 20 to 25 cm (8 to 10 inches) in diameter, and fringed by tapering red tentacles about 15 to 20 cm (6 to 8 inches) long and a finger’s width in diameter at their base, and about a pencil eraser’s width at their tip. Urticina piscivora adults could be collected fairly easily while diving by sliding a blunt object, like one’s thumb or finger, in a diving glove between the substrate and the animal’s pedal disk, which caused the anemone to gently pop off the rock, unharmed. After collection, the divers returned to the lab and put each specimen into an aquarium. 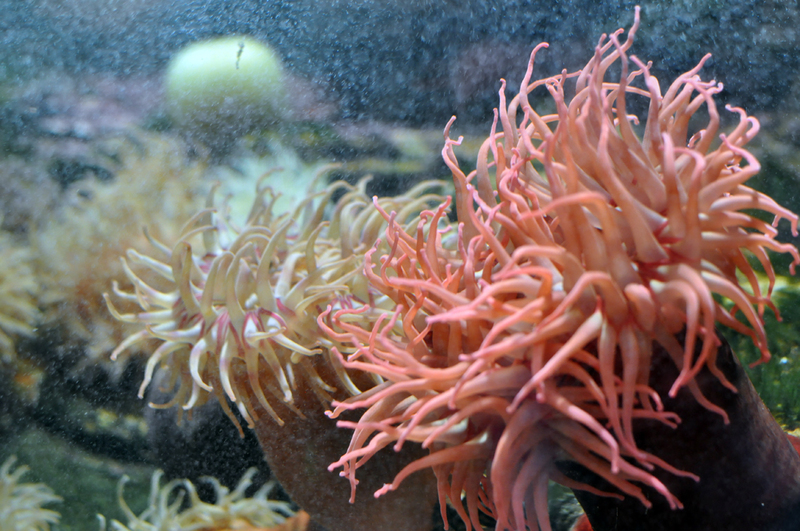 If the aquarium was big enough, the anemones typically inflated themselves to about the size of a basketball and drifted around the tank rather like large red dust bunnies encased in a layer of tentacles loaded with nematocysts that can give very nasty stings. 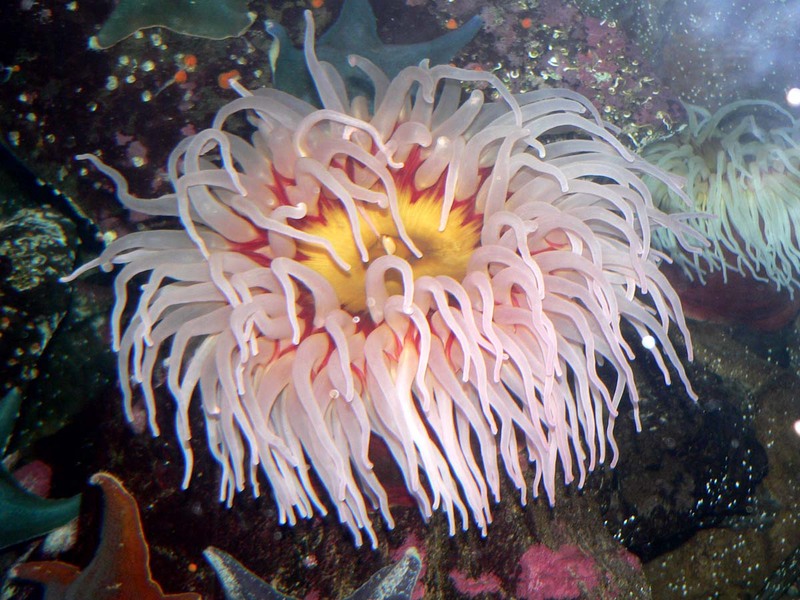 Fish Eating Sea Anemones in the wild at Cia Rock, Vancouver Island, showing the diversity of coloration this species can display. Image by Dr. Ron Shimek. Without really having a plan, other than working with U. piscivora, one of the young gents decided to collect some anemones. He found out where it was probable to collect some of the anemones. He assembled a diving team and went out on a nice late spring day to collect some critters. His team was quite successful, and they collected about a half dozen nice adult animals. Upon returning to the lab, the student had put six or seven U. piscivora in a sea table that was about the right size for one or, just maybe, two of them. A couple hours after this, he looked me up, and telling me what he had collected, asked how he should best maintain these critters. I suggested that, given that as these were large and aggressive animals that functioned totally on a reflexive level, he should maintain them in separate aquaria or they would likely become antagonistic to one another and sting each other to death. He got the classical “OOPS” look on his face and rapidly made his exit. As I was not asked to assist him, I went back to my own work. When I saw him next, it was a few hours later, at dinner time, in the facility’s dining hall, and he had bandages on both his upper and lower lips. Of course, I had to ask, “Why the bandages?” He related, mumbling, and obviously in pain, that earlier after he left me, he ran downstairs to his shared lab with its sea tables. Upon entering the room, he was horrified to find one of his precious anemones had detached from the aquarium bottom and been carried by the current to the drain, where, in the manner of gelatinous things everywhere, it had been sucked down the drainpipe partway, where it had inflated, sealing itself in the drain. At this point, did he turn off the incurrent water, put on some gloves, and remove the wayward animal? No, OF COURSE he didn’t. Instead, he quickly reached under the tank and grabbed the long hose draining into the tank below. He put the excurrent end of the hose in his mouth and blew, trying to blow twenty or more pounds of gooey gelatinous snot-like anemone back out of the drain against the head of water pressure pushing it down the drain. Surprisingly (knowing me), as he was telling this, I didn’t laugh or even crack a smile. All I could think of at the time was how horrible this must have felt. Ouch!!!!! I can only imagine how much it hurt, stinging his lips, tongue, roof of his mouth, and the inside of his cheeks. And it STUCK to him. As he tried to remove it, it broke and more pieces got stuck. And he REALLY did not want to swallow it. And, fortunately, he didn’t. Some other students in the shared lab room, seeing and finally realizing what was going on, quickly grabbed him, helped him as best they could, and trundled him down to the dock, got him into a boat, and took him to the other side of the inlet, where the community nurse was located. Fortunately, she was still on duty and was able to anesthetize his mouth and lips. She spent a half hour picking out pieces of disintegrating anemone tentacle with forceps. She bandaged him up and he returned to the lab, after finding out that there is no antivenin. The swelling was pretty impressive when I saw it, about five hours later. There is no treatment, other than letting it go away. At this point, apparently, our conversation had gotten too painful, and he left the dining hall and retired to his dorm room. 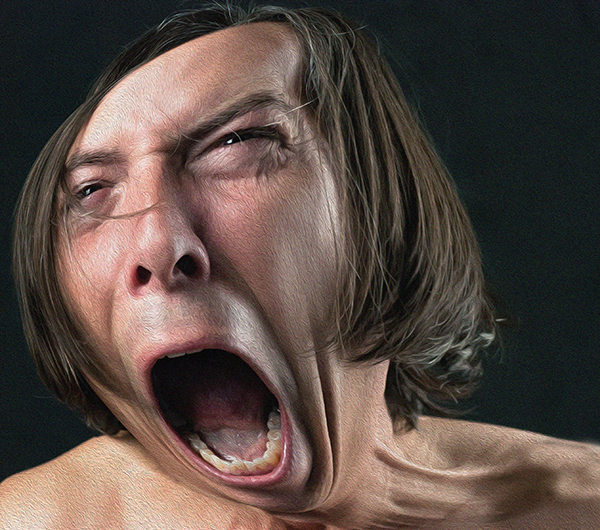 Within a day, most of the swelling had gone down, but he had developed beautifully open necrotic sores, some more than a couple of centimeters long, on both the upper and lower lips. Nicely blood red and gooey in the center, the sores’ flesh was black, discolored, and dying at the edges. They felt good, too, I understand. Over the next six weeks, while I was there teaching, he sort of skulked around in the lab with bandages over his mouth, mumbling. By this time, I am afraid, most everybody at the lab, in addition to realizing the danger of the animals, saw some grim, rather macabre humor in the situation. At the end of the term, some six weeks later, my teaching for the time was finished and I went home and he left to go talk, er, mumble with his adviser. The other grad student who had been much more careful and professional also went to talk to the same adviser. The other grad student now has a fully tenured position at a university. The moral is: Never underestimate the power of nematocysts. Wear gloves in your aquarium. And don’t kiss any animal with nematocysts. I don’t know if vinegar or heat, as we will discuss in a second part of this series, would have helped in this situation. It likely wouldn’t have made it any worse, and surely would have been worth a try, but nobody even thought of suggesting it when it was apparent what was happening. Cnidarian Stings Part II: First Aid for Sea Jelly Stings by Ronald L. Shimek, Ph.D.